Pellets made of compressed wood waste are another popular fuel. Pellet fuel is distributed in 40 pound bags and is available at most hardware stores, feed stores, lumber yards, even large grocery stores as well as hearth products stores. The fuel is stored in a hopper inside the appliance and metered by automatic controls into a small cup in the stove called a burn pot where air is forced through the burning pellets, producing a hot, almost smokeless fire. 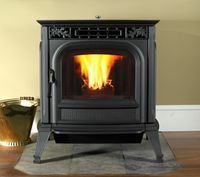 Many pellet appliances are self igniting and they can operated from a thermostat.